Does Els have the advantage at Wentworth? 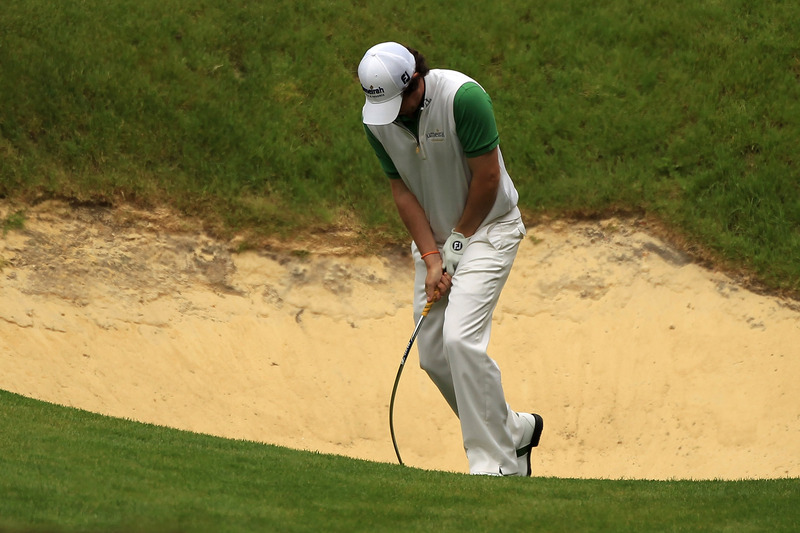 Rory McIlroy damages his club after getting stuck in the sand on the 10th hole. Ernie Els should feel right at home on Wentworth’s west course - and you’d think that after designing it he would have an unfair advantage over the rest of the field at the BMW PGA Championship. Golf is unique in many ways and this is just another twist when a player can directly influence about 7000 yards of landscape, and then head out to compete in European flagship event. Though, I think it would be a bit of a stretch to think that if Els won it was because of the advantage of designing the course, because he has been playing great golf this year. It was a good thing that a player of Ernie’s ilk - who has seen the game evolve quite dramatically since he first teed it up at Wentworth in 1992 - put his touch on the Wentworth course. He brings with him the experience of still playing among the best on both sides of the Atlantic which I feel gives him a better vision of where the game is going for professionals and how to challenge them now. The players hit long and have more control over their shots which meant for too long that Wentworth was at their mercy. Not any more as Ernie has rightly given it some teeth. Precision is rewarded and anything else is severely penalised. It’s the biggest change Wentworth has ever undergone and Els has tried to lay the foundation for a course that will challenge the very best in the game for the next 15 years. Where the course loses out is around the green of the par 5 18th that was reshaped with a risk and reward in mind in order to add more drama come Sunday afternoon. But it’s failing because there is just too much risk with the brook skirting the front of the green and the players are laying up. Ernie said this week that he and owner Richard Caring had plenty of heated disagreements when redesigning the course and it was Caring who won the argument about how best to make the 18th. What on earth was an owner of course doing having the final say over Ernie when it comes to course design and especially on the course’s showpiece hole? Now the players are coming off the green during their rounds at the BMW and slamming the hole as a failure. Maybe Ernie has a wry smile on his face in private, but in public he is still defending the course. He was doing a lot of that during the week which would have made it hard for him to focus on playing good golf.